The War in Afghanistan, the longest war in American history, will finally come to an end in 2014 as it transitions from a combat mission to a support mission in 2014, which would give the U.S. Military and advisory role. 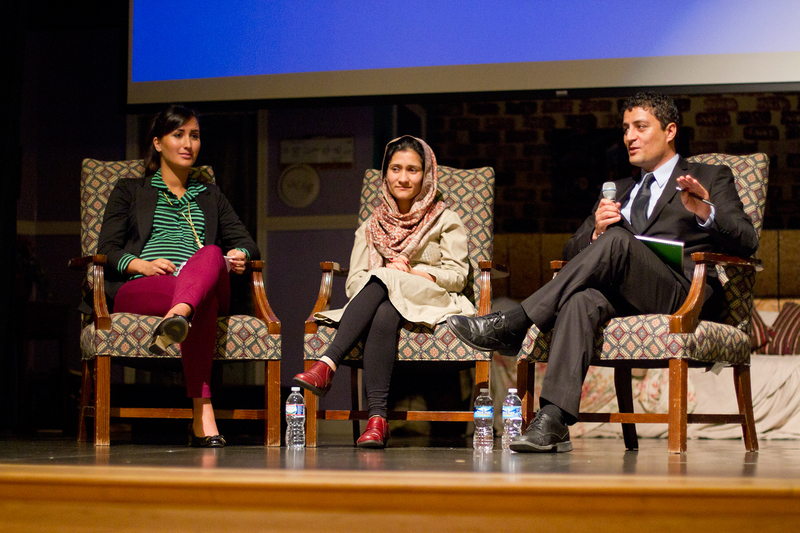 The panel discussion held in the Nolan Center on November 14 offered an understanding of both the struggle for women’s rights in Afghanistan and the pending U.S. Afghan bilateral security agreement. The security agreement is said to establish a long-term relationship with Afghanistan, which includes the U.S. paying for Afghan security forces and allowing the U.S. to keep military bases located in Afghanistan. Possibly valid until 2024, the agreement will keep 10,000 to 15,000 thousand troops in Afghanistan, a much smaller number in comparison to the 44,500 troops that currently reside there. Undersecretary of State for Afghanistan and Pakistan Affairs and Southeast Asia at the U.S. Department of State Eileen O’Connor (mother of Mikey `09, Gabby `10, Izzy `13, and Frankie `15 Bilotta) moderated the discussion. Panelists at the assembly on the advancement of Afghan women were Yelda Kazimi, policy advisor on Afghanistan and Tajikistan in the Bureau of Democracy, Human Rights and Labor; Shabana Basij-Rasikh, co-founder of School of Leadership Afghanistan (SOLA); and Shafi Sharifi from the Alliance in Support of the Afghan People (ASAP). They all emphasized the importance of the U.S. presence in Afghanistan as not only helping women gain more rights but also deterring terrorist group the Taliban. The greatest fear surrounding the U.S. drawdown in the War in Afghanistan mentioned by all the panelists is that the presence of the Taliban may bounce back. This would undo the reason why the U.S. entered the war in the first place, to eliminate the Taliban regime. In agreement, Sharifi noted the success of international forces in Afghanistan that contributed to his sister’s ability to receive an education and eventually become a doctor after the upheaval of the Taliban in 2001. Other panelists referred to Afghanistan’s transformation into a “vibrant and hopeful society” and cleared up some common myths regarding Afghanistan. Kazimi said that while there are more reports of domestic violence by women today, it is only because women know they have the right to report it. Basij-Rasikh also made clear that the hijab, head scarf, and burka, full-body garment, worn by many Muslim women is not a form of discrimination. Many women choose to wear it out of devotion to their faith.